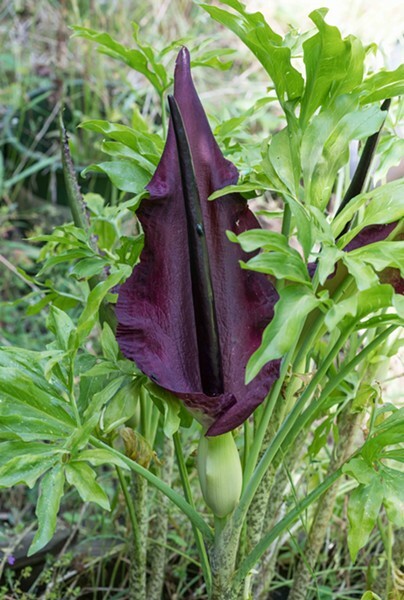 The dark and mysterious Voodoo lily. Once, when I was a kid, my mom sent me out to the garage to get some hamburger from the old chest freezer. When I opened the lid I was nearly bowled over by the smell. Someone had left it unplugged for weeks and the half side of beef had turned nasty. You may wonder what this has to do with the insects I usually write about. Well, smells can evoke strong memories. It's springtime and my Voodoo lily (Dracunculus vulgaris) is blooming. A member of the arum family, it smells just like that old freezer for the one or two days the flower blooms. 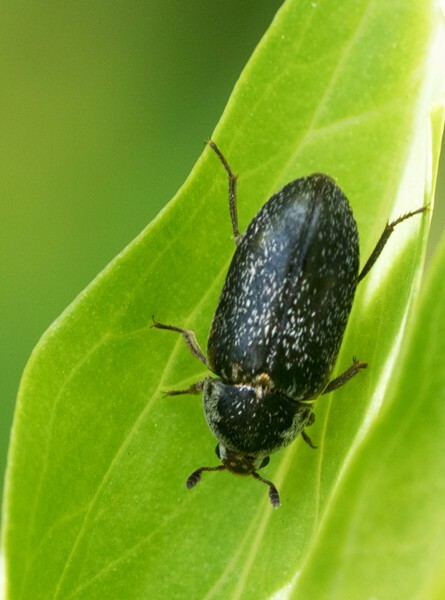 These guys don't rely on bees to pollinate them, but on flies and beetles, specifically the kind of flies and beetles that are attracted to dead and decaying animals. 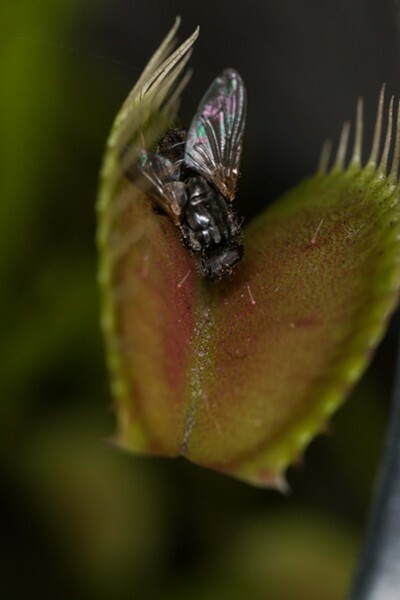 While not considered a carnivorous plant, they do attract and often kill a great number of green and blue bottle flies, a carrion beetle or two, and a couple of species I have yet to identify as they all vie for the chance to feast on the rotten meat that isn't there. I have had buzzards swoop through the garden when the lilies were in bloom. A carrion beetle lured onto the lily by the rotting meat smell. Unlike true carnivorous plants, this one depends on the insects for pollination services, not nutrition. To the best of my knowledge, it does not gain anything from the dead insects that accumulate in the base of the flower. Although someone with a bunch of radioactive flies and a PET scanner might be able to prove otherwise. A blue bottle fly drawn to a Voodoo lily. Mostly evolving in nutrient depleted swamps, true carnivorous plants supplement their diets with nitrogen supplied by digesting insects. Species grow on every continent except Antarctica. 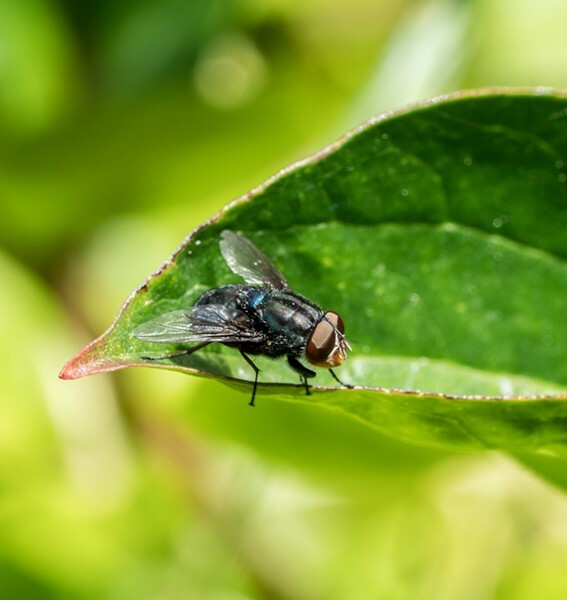 A fly on a Sarracenia pitcher plant. Trapping mechanisms range from the simple pitfall traps of Sarracenia, Heliamphora, Cephalotus and Nepenthes, the more complex trap of our local native Darlingtonia californica, to the flypaper sticky traps of Byblis, Drosophyllum, Drosera and Pinguicula, to the intricate active traps of Dionea, Aldrovanda and Utricularia, and the exotic corkscrew spiral trap of Genlisea. There are even some species of fungi that trap nematodes with an inflating noose structure. Over the years I have survived raising many of these interesting plants. A fine reference book on their cultivation is The Savage Garden by Peter D'Amato, the revised edition of which I have not yet had the opportunity to read. The Venus fly trap and a fly about to be, well, trapped. Oh, a hint: Those nifty Venus' fly traps you buy at the nursery will thrive living outdoors so long as they're kept wet, don't freeze solid and get some protection from direct sun, as they would in their native Carolina bogs. Winter dormancy is essential for them to recover in the spring and thrive.